Archer, Pam, and Crackers try to find the missing key to their latest get-rich-quick scheme, while Mallory and Charlotte work out their business relationship, as do Cypert Fuchs and Lana. “Different Modes of Preparing the Fruit” includes exactly two flashes of the “real” world of the show beyond Archer’s extended coma dream. The first comes in the form of a check to its constructed artifice, when Pam describes a tricky situation as a Catch-22 and Archer shoots back, “I don’t think that’s a thing yet.” (This season takes place during the preamble to World War II; Joseph Heller wouldn’t even start writing his calling-card novel until 1953.) The second one busts right through the fourth wall, as Pam clarifies that the idol everyone’s searching for is most assuredly not a gold monkey while staring the viewer right in the face. (This is in all likelihood a nod to the short-lived ABC series Tales of the Gold Monkey, or rather, a firm declaration from creator Adam Reed that he’s not ripping anybody off.) Archer hasn’t fully lost sight of itself, and it’s starting to look like Reed may return to Archer Classic for the show’s tenth and final season. The Underpants Monster called it on the Gold Monkey reference in episode 1. I included the less than positive Paste magazine review, because there aren't many reviews out there. Also, to provide an alternative viewpoint, or something like that. And in calling out references, Crackers asks Sterling and Pam what they're discussing, and (I think) Archer says "Why you're not a dog." That's likely a reference to early discussions about this season including the possibility that Lucky Yates could play a dog. I had to rewind and watch that part again, because I couldn’t hear the dialog because I was laughing too hard. "IT'S NOT. A GOLD. MONKEY." Why am I speaking English??? Okay the lines about the idol not being a monkey, and especially not being a gold monkey were great, but the capper to that scene, wondering why Crackers was not a dog, had myself and the other person in the room watching the show practically in stitches, because of course Crackers should be a dog--specifically a small, dog wearing an eye patch (or not). 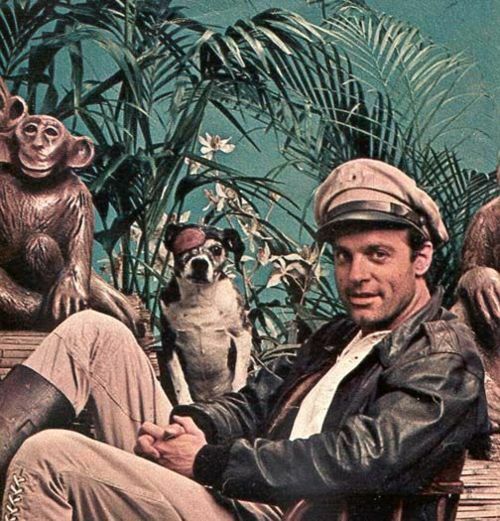 While Stephen Collins was the star of Tales of the Gold Monkey, playing a pilot named Jake Cutter, the breakout of the series was Jake's dog, Jack. (Yes, the Jake and Jack confusion was played up during the show.) If Lassie had a Master's degree in understanding human speech and making humans understand her, Jack was a post-doc in "Timmy's in the well." That's why, in the first episode, the line about Crackers speaking English, it's just what he does, immediately hearken back to Gold Monkey, because while Jack couldn't actually speak, he might as well have, and the characters just accepted his smarts. ("Bark once for yes and twice for no.") Jack only wore his eye patch when he wasn't in possession of his glass (well, gemstone) eye , which often went missing due to theft or being anted up in games of chance. Okay, while I'm probably not the best person to do this, I feel it's likely a good time for a Gold Monkey primer. It has been ages since I've seen this, so I may be a bit fuzzy on some of the details. As mentioned, Jake is a pilot with previous war experience as a Flying Tiger. He's charming and quick-witted. He has stubble on his chin, sports a peaked pilot's cap and his leather jacket from his Flying Tiger days. 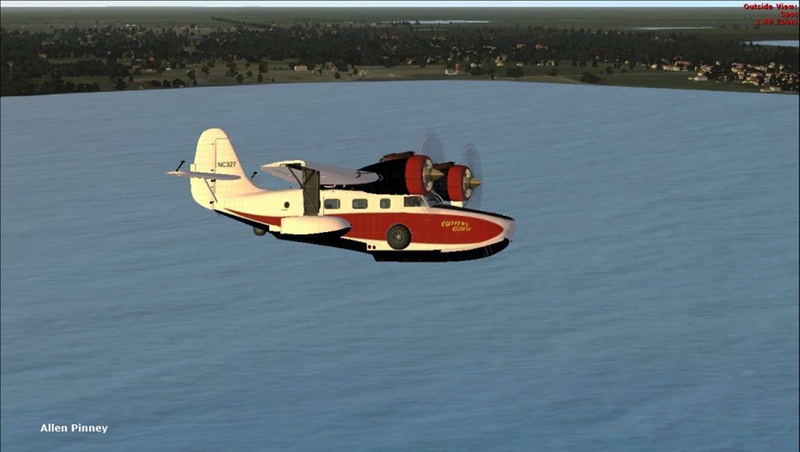 He flies a Gruman Goose, that's decorated in a distinctive red and white paint scheme. Its name, Cutter's Goose, is in a very recognizable script. (Yes, this all predates Duck Tales.) Jake is usually broke, and doesn't have the money to keep the plane in tip top shape, so it's held together luck, prayers, and salvaged scrap. One engine (I think) was notorious for cutting out. Jake relied on his mechanic Corky, (Bellisarius regular Jeff MacKay from Magnum, p.i. and Black Sheep Squadron) to keep the Goose up in the air (so Pam is essentially Corky). He was usually dressed in mechanic's overalls, and was very, very, very fond of his liquor. But he was loyal to Jake and spent a lot of time talking to Jack. Roddy McDowell was Louis, the French owner of the Monkey Bar, the local money man and fixer, and the all-around guy in the know (so Malory equals Louis). He was usually dressed in full-suited tropic whites. He, of course, had a mysterious past. The local Nazi wasn't a grapefruit investor or an museum collector. Instead he was a "priest" with a very pronounced interest in the local, female residents of the island. The show was far from perfect, it was culturally problematic even then, and by today's standards, oh boy, let's not go there. It was however, light and fun, with a good dash of adventure, and it was entertaining TV. In comparison to its contemporary jungle adventure competition, Bruce Boxleitner's Bring 'Em Back Alive, this was the better show. Oh, and in case anybody starts making cracks about the idol being brass instead of gold, there is precedent in Gold Monkey for that. Underpants Monster, feel free to jump in and correct/add to what I've written. Yes, Ducktales was also a blatant TotGM ripoff. Disney, ripping off and copyrighting other people's stories? I'm shocked, shocked! No corrections, sardonyx, that was awesome! You remembered stuff about Corky and Sarah that I had forgotten. Just one addition: McDowall's Bon Chance Louis was also the island's French magistrate, so I guess he's been kind of split up into Malory and Ray. Given Judy Greer's singing voice, I've got my fingers crossed for at least one chorus of "Am I Blue?" before the season's over. I'll admit, I had to cheat a bit on some of the character's names. I also forgot about Sarah's more complicated backstory until I saw mention of it when I was looking for links to include, and then it came rushing back and hit me like a ton of bricks. Yeah, I just figured I'd better include Duck Tales in the timeline, just in case people thought it was the inspiration and Gold Monkey was the homage. It's amazing for a show that didn't last very long, it has a pretty strong cultural impact with those who watched it (and have watched what those people have created). As for Disney ripping stuff off, yeah, colour me equally surprised. I'd be perfectly up for an "Am I Blue" inclusion as long it it was accompanied by at least a tiny reference to the WonderBat relationship in Justice League (the cartoon not the movie). I mean if Archer can't reference another influential cartoon, than what can? Also, I really wanted to comment on the background scenery this episode (these past two episodes). That sunset over the sea was just gorgeous, and that streetscape with all of the shops and buildings was beautiful. When the art department on this show is on, they're really on. I think you are thinking of Disney’s “Tailspin”, not Ducktales. Ducktales was largely based on Carl Bark’s Uncle Scrooge comics from the 40’s, 50’s and 60’s. Yes, I was just coming in to correct that! TaleSpin and DuckTales were out around the same time, both Disney, both had "tale" in their name, and I haven't seen either for decades! Baloo the Bear and King Louie the orangutan from The Jungle Book played the Cutter /Archerand Louis/Malory roles. I was more of a Rescue Rangers fan. But seriously, I was a bit past the optimal age range for viewing that whole crop of Disney cartoons, as is evidenced by the fact that I was watching Gold Monkey and its contemporaries, hence the Tailspin/Duck Tales mix up.